I love fried foods. Japanese food is full of fried foods like Tempura, Katsu and Korokke. Although fattening, it's hard to give up fried foods. 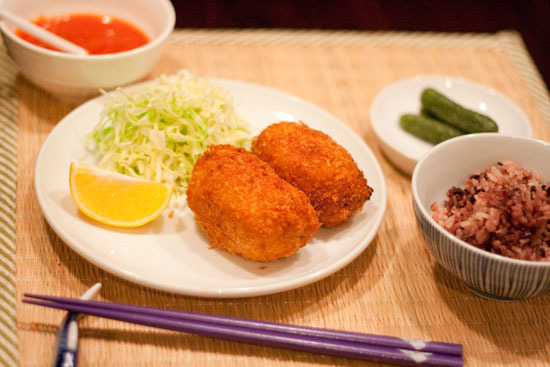 Croquettes are very popular in Japan. There are many variations and it is a common dish in a Japanese household. You probably won't see these in a fancy restaurant. These are often found ready-made in the deli sections at the grocery store, for convenience. Many people take advantage of this, as an inexpensive and easy dinner. 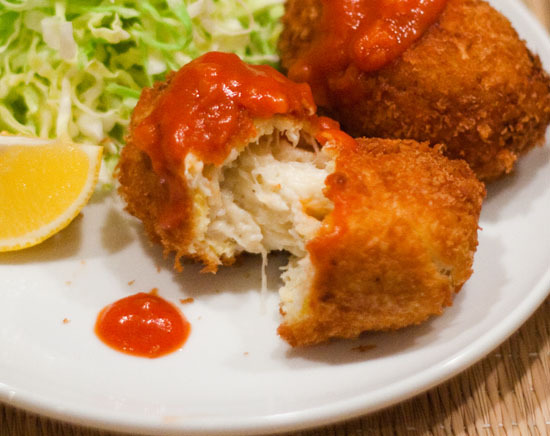 These Crab Cream croquettes are my son's favorite and mine too. It takes a little time to make a bechamel sauce (white sauce) for the filling but it is relatively easy to make. When forming the patties you can make either flat ones or cylindrical ones. I like crispy ones so I usually put 2 coats of egg and panko. Fried foods are most delicious when just fried so make sure to get everything else ready first. In a pan, sauté the onions in 30g butter until lightly browned. Put aside about 1/3 of the onions for the sauce (see below. Add mushrooms and sauté until the mushrooms are limp. Set aside. Melt 70g butter in a skillet pan over low heat. Sprinkle flour over the butter and stir in gradually until smooth, like a creamy paste. Add milk in parts, stirring well each time until incorporated. Once all the milk has been added, the mixture should not be runny but thick. Add onion, mushrooms, crab meat and crab juice. Stir. Add the egg yolk and stir constantly for 2 or 3 minutes while cooking. Add salt and pepper. Set the mixture aside in a bowl. Let it rest in the refrigerator for 15 minutes or so. Make patties with the mixture, dip into the flour, egg, and then panko, coating well with each dip. Pat it to make the panko stick. Heat 2 inches of vegetable oil in a cast iron pan until hot (over medium heat). Fry the patties until golden brown. Do not turn the patty until it is set on the bottom side. Drain on a paper towel lined plate to absorb excess oil. Eat while warm with sauce. Put onions in saucepan over medium low heat. Add tomato sauce, water, and wine. Stir and add salt and pepper for flavor. Cook until it just barely simmers (about 3-5 minutes). That looks delicious. I love deep fried stuff as well. How fun that you started a blog. Mariko told me she was going to try and convince you to start. I think you'll enjoy it. Thank you for all your comment. I will upload new recipe tomorrow. おいしそう! Your bechamel looks so creamy, I love koroke! Welcome to the food blog world. 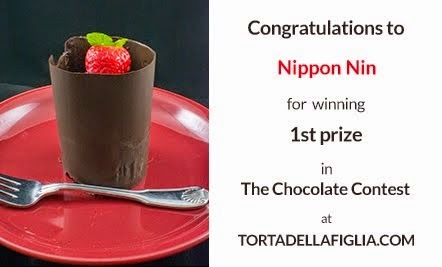 We need more Japanese food blogs writing in English. Great blog! The croquettes look amazing! holy christ - that looks delicious!! Ellie, Thank you for visiting my very first blog post. Wow! 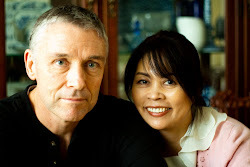 I'm doing blogging for 6 months(as of 6/5/2011). I learned lots from my daughter and supports of my husband. I love Kani Kuream Korroke :) Yours look amazing!! Dear Mamaloli san, Thank you so much for visiting my very first food blog. I like your blog very much with all those yummy Japanese foods! Where do you add the cream in this recipe? It's listed in the ingredients, but I don't see it being used in the recipe... Thanks! Thank you for vising. I apologize for not explained clearly on this recipe. The cream you need to put in about same time you put crab meat.